CHALLENGE #15: I know a hand-written thank-you car is far more personal than an email but also more expensive. 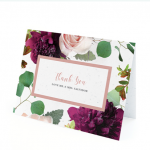 Is there a way to repurpose a thank-you card? - JAE associates Ltd.
Use a card with embedded seeds. Your message is received and enjoyed then your recipient gets added value with the flowers, herbs or vegetables they grow from planting your card! The paper feels cool because of its texture, it’s eco-friendly, and you are memorable for months to come. Want to leverage those memories? Create a social media campaign with your recipients sharing their planting experiences. It’s a great way to grow together.